After the accession to the throne, the Emperor Kanmu(桓武天皇) moved the capital from Nagaoka-Kyo to Heian-Kyo, Kyoto, in 794. The event finished the Nara Period and its culture(Tenpyo Culture) , instead of starting Heian Period(平安時代). The inflow of the culture from the Asian Continent came to an end with the abolition of the envoy to Tang Dynasty China in 894. It fostered the unique culture that the nobles created delicate and sophisticated Kokufu Culture. Kokufu means the original style of Japan. The theory explained that Buddha changed the appearance temporarily into the Japanese gods and descended to the country. Dainichi-nyorai(大日如来) turned out to Amaterasu Oomikami(天照大御神), Amida-nyorai(阿弥陀如来) to Hachiman God(八幡神),Fukukenjaku-kannon(不空羂索観音) to Kasuga Daimyojin(春日大明神). During mixing Shinto and Buddhism, two monks, Saicho(最澄) and Kukai（空海）, introduced the esoteric Buddhism into Japan in Heian Period. They made a voyage to China by the order of Emperor Kanmu before the abolition of the envoy. The emperor wanted to borrow the power of Buddhism to provide stability for the new capital. Toji(東寺, the East temple) and Saiji(the West temple) took the role of that. Coming back to Japan, Saicho felt keenly the necessity of a place for the learning and the training of Buddhism. He opened the temple, Enryakuji, in the Hieizan mountain in 788. He taught people that everyone could become Buddha according to “Lotus Sutra”. Emperor Saga(嵯峨天皇) deeply believed him and gave the name of Enryakuji the temple when he died. A year later the back of Saicho, Kukai also stood on the ground of Japan again with a lot of the sutra and the pictures of Buddhism. Emperor Saga protected Kukai too and allowed him to establish the head temple of Shingon sect, Koyasan Kongobuji. He started the temple as the training for Shingon sect in 816. And Emperor Saga gave him Toji to spread the teachings of Buddhism in 823. Since early 11th century, the other teachings of Buddhism was widely believed. Pure Land teachings based on the thought that people could go to the land of Perfect Bliss after death if they just believed Amida-nyorai. The trend of Pure Land teachings had the sufficient reason. Because people thought that the teaching of Buddha would fade away within decades. That was Mappo shiso(末法思想), the “end of the world” belief. They accempt the fact and hoped happiness in the next world. It led them to the sect. Not only common folks but also the nobles including Fujiwara Michinaga(藤原道長) chanted “Namu Amida Butsu”. And his son, Fujiwara Yorimichi(藤原頼道) changed the villa into the temple, Byodoin(平等院). Chusonji(平泉) and Motsuji(毛越寺) in Hiraizumi were influenced by Mappo shiso as well. In early Heian Period, a lot of Buddha statues of Myoo with some faces and arms, Nyoirin-kannon(⇒the image at Kanshinji), and Kokuzo-bosatsu, as influenced by esoteric Buddhism. 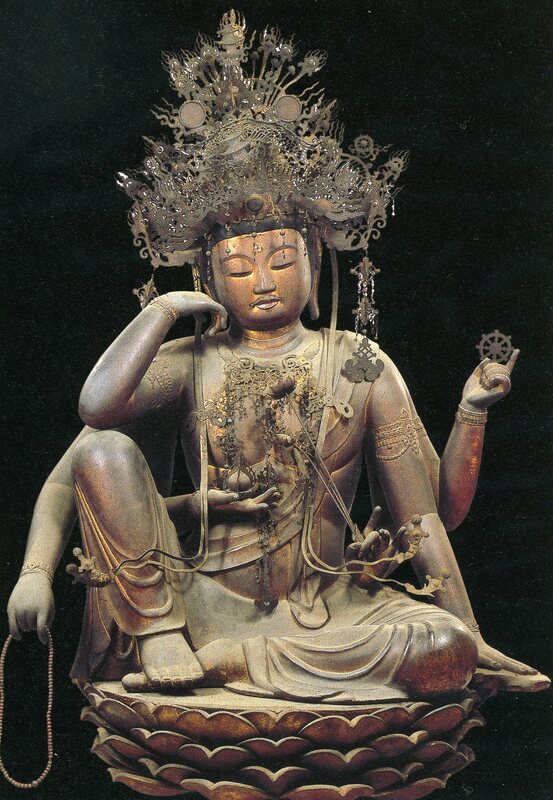 The new method of producing of Buddha statue came into exsistence by a sculptor Joucho(定朝) in later the period. The Jocho style used many parts of woods and put it together, that is to say, wooden mosaic work. It made possible to mass-produce Buddha statues rather than from a single wood. Because many people believed Mappo shiso, it needed to make a large number of the statues such as Sanjusangendo in Kyoto. The figures in the period take rounded shape and gentle expression. The nobles in Heian Period lived in a Shindendzukuri residence. The main room(Shinden) faced the south side that often had a garden and pound. And a pair of rooms(対屋, Tainoya) put the Shinden between them. These structures were connected with the corridors. Of course, the fences (築垣, Tuigaki) surrounded these structure, and had the gates on the east and west side. Speaking about the building in Heian Period, Kyoto Gosho(京都御所) and Itsukushima Shrine(厳島神社) belong to the style. Until Nara Period, Japanese people had written letters of Kanji, Chinese character, because they hadn’t had own. At last, they invented Katakana for ruby of Kanji and furthermore Hiragana in Heian Period. It took so many time to write with Kanji but Katakana reduce it. The simplification expanded the range of literacy. Especially the noble women started writing because Kanji had been considered as the letter of man. The invention of Hiragana also changed the way of calligraphy to softer and finer. For building up the unique style, the master-hands turned up. Ono-no Tofu(小野道風), Fujiwara-no Kouzei(藤原行成), and Fujiwara-no Sari(藤原佐理) are called as three excellent calligraphers throughout the history of Japan. Following the collection of poems in Nara Period “Manyoshu”(『万葉集』), the original poetry style Waka(和歌) became popular among the Heian nobles. Thus they used Waka as the tool of social relationships. Then Emperor Daigo(醍醐天皇) ordered Ki-no Tsurayuki(紀貫之) Ki-no Tomonori(紀友則), Mibu-no Tadamine(壬生忠岑), and others to compile the poems. “Kokin Wakashu”(古今和歌集) is the oldest an anthology in Japan. And it contains 1100 poems composed by anonymity, Rokkasen(六歌仙, the six experts of poetry), and the editors. The purpose of the diaries written by the nobles were intended to open to the public, the official record of bureaucratic proceedings, since Nara Period. But the penetration of Katakana for the noble woman really changed the way. “Tosa Diary(『土佐日記』)” that Ki-no Tsurayuki pretended a woman and wrote the story of the travel pieces from Tosa to Kyoto. The mother of Fujiwara-no Michitsuna(藤原道綱母) showed closeness and uneasiness of woman who lived in aristocracy by “Kagerou Diary”(『蜻蛉日記』). “Sarashina Diary”(『更級日記』), by the daughter of Fujiwra-no Takasue(菅原孝標女), and “Izumi Shikibu Diary”(『和泉式部物語』), by Izumi Shikibu, dipicted the their personal life or loves. The oldest novel in Japan “The Tale of the Bamboo-Cutter”(『竹取物語』) came into the country in the period. No one knows who write it. The women also took an active role in the tales and the essays. Murasaki Shikibu(紫式部) wrote “The tale of Genji”(『源氏物語』) a long story of a noble man, Hikaru Genji(光源氏) and more than 500 people in the Court. He had many relations with women and reached the hight of the prosperity. Sei Shonagon(清少納言) expressed what she felt “okashi” that means beautiful, refined, and interested in “The Pillow Book”. Yamato means Japanese, so Yamato-e is Japanese paintings. The paintings from Asuka Period to Nara Period, the paintings in Japan had only followed Chinese(Karae, 唐絵) . But the Heian painters began to create their own works of art. They invented the way to join papers in a horizontal direction, scroll paintings. It made the arts possible to tell long stories, like The tale of Genji or the comic. Choju-giga(鳥獣戯画) . It is the oldest comic in Japan that most likely the monk Kakuyu(覚猷) drew and Kozanji temple have kept. However there are four scrolls on the whole of Choju-giga, only the first half, the characters of personifications, were painted in Heian Period and rest in later age. The poetry of the Heian court of Japan has typically been linked with the emergence of a distinct Japanese language and culture. This concept of a linguistically homogeneous and ethnically pure “Japaneseness” has been integral to the construction of a modern Japanese nation, especially during periods of western colonial expansion and cultural encroachment. But Thomas LaMarre argues in Uncovering Heian Japan that this need for a cultural unity—a singular Japanese identity—has resulted in an overemphasis of a relatively minor aspect of Heian poetry, obscuring not only its other significant elements but also the porousness of Heian society and the politics of poetic expression. Combining a pathbreaking visual analysis of the calligraphy with which this poetry was transcribed, a more traditional textual analysis, and a review of the politics of the period, LaMarre presents a dramatically new view of Heian poetry and culture. He challenges the assumption of a cohesive “national imagination,” seeing instead an early Japan that is ethnically diverse, territorially porous, and indifferent to linguistic boundaries. Working through the problems posed by institutionalized notions of nationalism, nativism, and modernism, LaMarre rethinks the theories of scholars such as Suzuki Hideo, Yoshimoto Takaaki, and Komatsu Shigemi, in conjunction with theorists such as Derrida, Karatani, Foucault, and Deleuze. Contesting the notion that speech is central to the formation of community, Uncovering Heian Japan focuses instead on the potential centrality of the more figural operations of poetic practice. Specialists in Japanese history and culture as well as scholars working in other areas of cultural criticism will find that this book enriches their understanding of an early Japan that has exerted so much influence on later concepts of what it means to be Japanese. This volume provides the most comprehensive treatment of the Heian period, the golden age of the Japanese imperial court, in any Western language. From 794 to 1185, the Japanese emperor ruled over an elaborate government modeled on China’s. Native Japanese elements blended with Chinese influences in religion and the courtly arts. The world’s first novel was completed about 1020. In 1185 the elegant and peaceful world of the court was shattered by the struggle of the Taira and Minamoto warrior clans, who usurped real political power. Exploring Ibusuki traditional culture in Kagoshima, Japan! This entry was posted in Period of Japanese History and tagged calligraphy, diary, essay, Heian, Kukai, poetry, Pure Land teachings, Saicho, Shindendzukuri, Yamato-e. Bookmark the permalink.